in red letters scrawled across the top. frowning over a brazier whose coals are eyes. I’ve ever met, grasping for change. Like all those other places where karma originated. every beggar an answer, meting out an earned revenge. All places are recognizable in time. as if to dare the logic from its cage. through which we all must pass in order to be free. 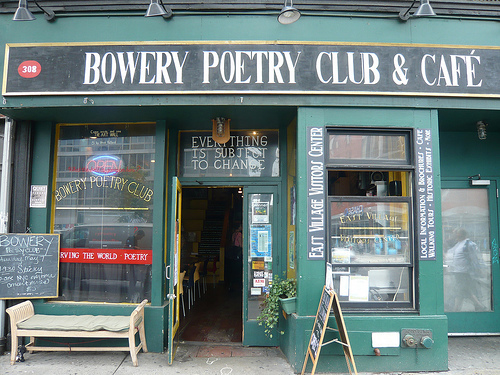 Check out The Bowery Poetry Club & Cafe, known for being one of the last vestiges of the fabled East Village arts scene, joined up with the TapIt Network this week. Although all their spirited poetry, jazz and cinema events typically take place at night, the daytime cafe is always a lively place to stop in for a refill on some great tasting tap water. 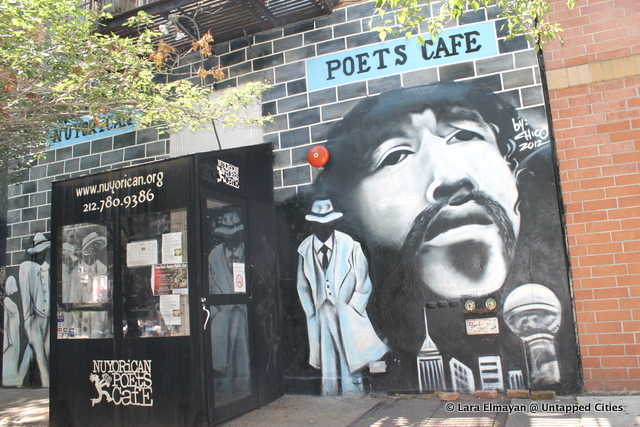 If you love slam poetry and live in New York, you’ve been to the Nuyorican, one of the last remaining places dedicated to poetry in Manhattan. Even if you don’t, give the Nuyorican a try anyway. Their team of in-house poets is the most inspiring, thoughtful, witty, even hilarious one in the city. And you will get hyped up to hear them–the venue’s hosts are usually nothing short of fabulous, and get the audience dancing between sets. Readings are frequently presided over by DJs with preferences for old school hip hop. When visiting, keep in mind that the word “cafe” is a bit of an exaggeration–there’s a bar you have to fight to get to, and some very closely-packed seating facing the stage. 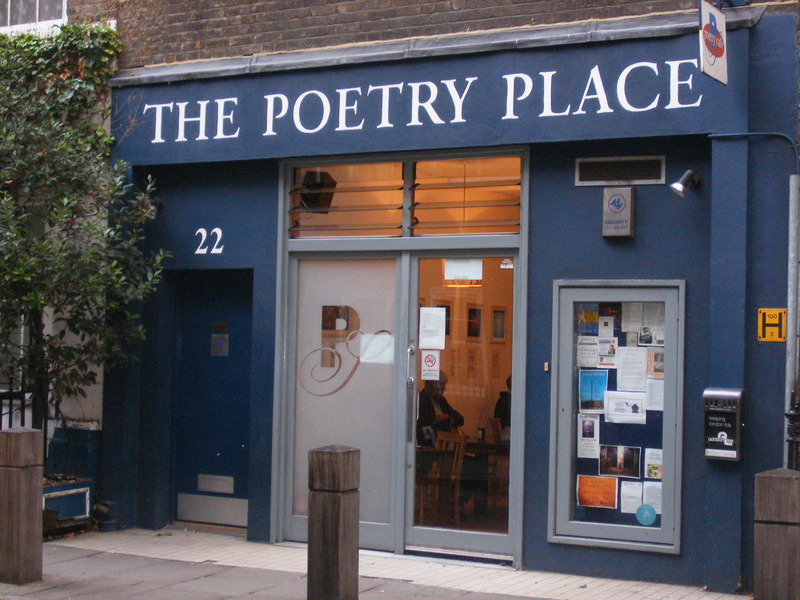 When in London, it’s The Poetry Cafe – a friendly cafe/bar/restaurant with live poetry performances. Quaff coffee in the company of artists, lyricists, poets and performers as the delicate strains of sonnets and similes, quatrains and couplets, ballads and blank verses float through the air. Hidden away on an unassuming Covent Garden side street, this cosy hideaway offers customers a gentle introduction to poetry combined with a tasty, warming afternoon tea. Toast, cakes and a selection of leaf and herbal infusions can be munched on in a delightful atmosphere of unassuming creativity. Managed by the Poetry Society, this cafe/bar/restaurant also doubles up as a performance space with a varied programme that includes the odd floor-spot – so if you’re feeling inspired by your cup of Darjeeling to pen an ode to ‘Tea’ this is the place to recite it. On Saturday evenings they hold a regular event in the Cellar highlighting the best in poetry and performance so why not follow-up afternoon tea with some of their excellent vegetarian food and then an hour or so discovering the best new and existing talent on the scene. A warm and welcoming, funky and friendly environment this isn’t one of those exclusive, high-brow joints. You don’t need to be a poet or even a liker of poetry to appreciate its charm – come and read the paper, contemplate life or simply sit back and sup – but here’s betting you’ll be writing sonnets before the teapot’s dry. Cosy hideaway, poetry, papers and performances, tea and toast.